My Name Is Gerard Milne. I am male, 77 years of age. I had visited My G, P. after having problems with my right ankle. I had broken this ankle some thirty years previously. After X-ray and discussion my Doctor thought there was not a lot could be done except Painkillers. Arthritis was at an advanced stage. I was lucky enough to be seen by Mr Devalia in August 2016. My diagnosis was confirmed as nearly total loss of cartilage in the main ankle joint on X-rays and an MRI Scan. Mr Devalia had further discussions in which he involved my wife Pat, and between us we decided to go ahead with a Total Ankle Replacement. I was diagnosed with Polio when I was twelve years old and was left with weakness in my left leg, which had also lost about an inch in length. I am using a walking stick to assist the left leg weakness especially climbing banks and hills. I had my ankle replaced on 25th of January. Next day After my operation, I was sitting in a chair and getting to bathroom using a walker. Friday, after a visit from Dr Devalia I had the drain removed and was whisked to the Plaster room and given the first of two plasters. I was visited by staff from the Physio department and had a practice run using crutches, going up and down the stairs. Two weeks later, February the 8th, I was back at the Queen Elizabeth to have the cast removed, and another one fitted. This was to check the wound, which looked really good. 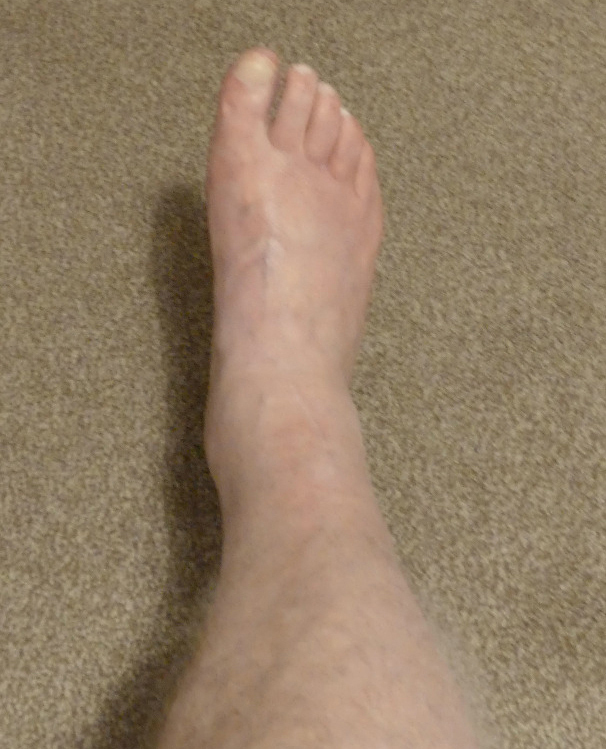 Another two weeks, I was back again to have the plaster removed (see picture) this time to be fitted with a huge boot which allowed the ankle to move by varying degrees. Mr Devalia gave the all clear for me to wear shoes and to taper off the use of the boot. Also the all clear to drive. This again made a big difference as Pat does not drive, so I was free to get to the coast, one of my loves. This has made a huge difference to the quality of my life. You can see that every step is monitored. And I am doing very well, I still have a way to go but most of this is caused by other problems. I have included a few pictures which I hope will show that I am mobile and pretty active. And for any ladies considering surgery by Mr Devalia I am including a picture taken ten months after operation, I am hard pressed to see where the scar is, I hope this is of some help to anybody with ankle and foot problems. Considering the complexity of ankles and the result when seen by x-ray, it is a remarkable operation. I would have no doubts about recommending Mr Devalia to anyone. I think my case will demonstrate to anyone thinking of a similar operation that in the hands of Mr Devalia, you will have the best chance to regain movement you thought was lost. I must at this point say a big thank you to the entire team at the Queen Elizabeth Peter Smith Surgery Centre. They are extremely efficient whilst being friendly and helpful in every way. 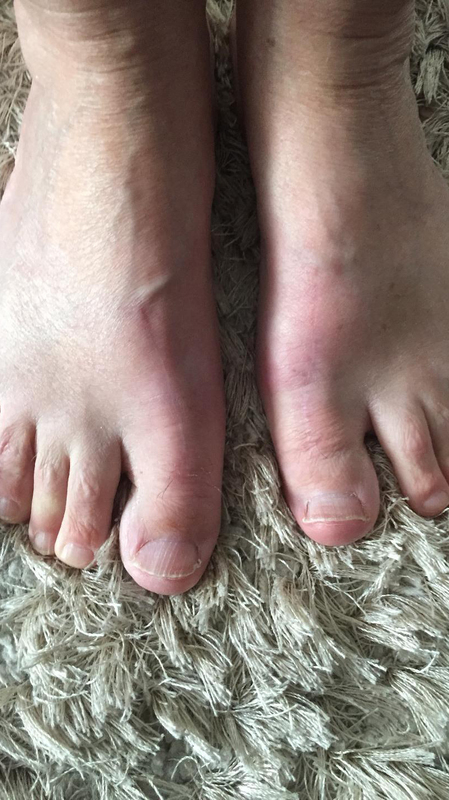 For a number of years I have been suffering from pain from bunions on both of my feet. It was at the stage that, when I wanted to go to any function I was unable to wear decent shoes as the pain was so severe. In the end, I decided to visit my GP following which I was referred to Mr Devalia at the Queen Elizabeth Hospital. Mr Devalia immediately advised me that I needed surgery on both of my feet, particularly my left foot which was by far the most painful. This was carried out in early 2017 and I can honestly say that it had made a vast difference to my foot and I am now able to wear a much wider range of shoes and I am much more comfortable when walking or during my everyday activities. I had been ‘advised’ by a number of friends as to how painful the surgery and recovery time would be and that it would be extremely uncomfortable. One in fact warned me that I would be unlikely to return to have the other foot done because of the pain and discomfort I would suffer from the first bout of surgery. Nothing could be further from the truth. Whilst there was obviously some pain it was nothing like I had been led to expect and in fact I wrote to the Hospital asking that they pass on my thanks to Mr Devalia. I then had my right foot done about six months later (I am not sure of the dates) and again, my surgery and recovery was much more comfortable than I had been led to expect. I am now able to wear shoes of my choice when I go to functions and I feel so much more comfortable in whatever I do. I was married in September 2017 to my long time partner and it was a pleasure and also a wonderful wedding present to me to be able to wear shoes befitting of the occasion for not only the ceremony but for the reception and the evening function, something I could not do prior to my surgery. "Mr Devalia has an amazing way with his patients, very professional and caring about his work. He is very good at his job and is a credit to the Queen Elizabeth Hospital. I couldn’t have a better consultant looking after me." "Mr Devalia is obviously a very capable surgeon, has a marvellous consultant-patient manner and is a credit to his profession and to the Queen Elizabeth Hospital. I was much more mobile and almost pain freeduring my recovery from operation and I am sure that this was down to the ability and care shown by Mr Devalia." "I want to say thank you to Mr K Devalia and his medical team for my very successful foot operation. Thank you for your special skills in the medical world that help many people to mend and, in my case, to be able to walk again without pain." "I have had better care and treatment under Mr Devalia at QE Hospital than the private hospital I was in six years ago. Thank you."